Shirshasana is called the King of Asana because it has so many benefits. The posture has to be taught and practiced with an abundance of care, or the neck will suffer and more than erase the posture’s benefits. 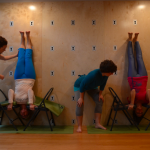 This workshop will also help you with your own headstand. Fees: Only $45! Register for this great workshop!